The college football season is halfway over, but that doesn’t mean you have half the interest. If you follow NCAAFB, things are just now starting to really heat up, so keeping track of your alma mater or favorite team is absolutely essential. 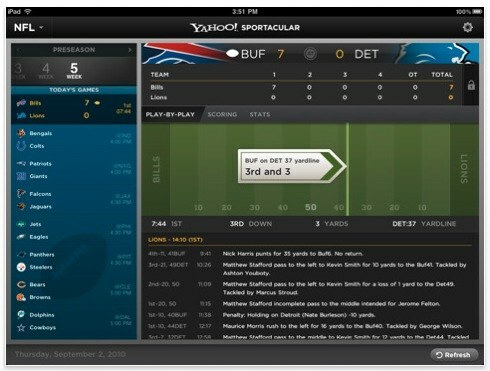 The iPhone and iPad make great tools to follow college football, and the best app I’ve found is called Sportacular. It’s a free download for either iPhone or iPad HD, and it’s feature rich instant-updates make it my go-to sports app all season long. 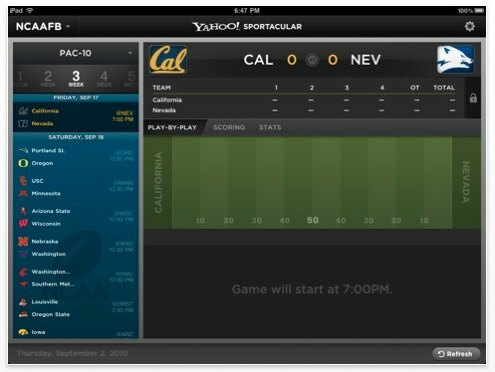 Sportacular has all the features you’d expect: score updates, team schedules, standings, news, play-by-play, team stats, and more. It’s a great app to refer to when you can’t watch a game, or when you’re glued to one game yet still want updates from others (sorry ESPN). You can grab Sportacular from the iTunes App Store, it’s a free download for either the regular iPhone app or the HD version for iPad. There’s also a paid ‘Pro’ version available but I haven’t found the need to upgrade. If there is a better app to follow college football with, I want to know about it!